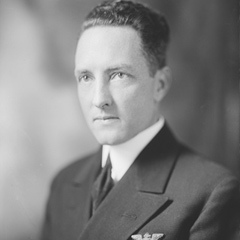 Image courtesy of Library of Congress A renowned naval aviator Richard E. Byrd, along with members of the Antarctic expeditionary team, were awarded Congressional Medals in 1930. On this date, President Herbert Hoover signed legislation by which the 71st Congress (1929–1931) awarded Congressional Gold, Silver, and Bronze Medals to the members of Rear Admiral Richard Byrd’s first Antarctic expedition. After successfully completing a trip through the Arctic Circle, Admiral Byrd led the explorers to Antarctica in December 1928 setting up a camp, nicknamed “Little America,” on the Ross Ice Shelf. For two years, members of the expedition weathered the harsh Antarctic conditions, collecting mineral deposits and mapping from their aircraft more than 150,000 square miles of previously uncharted territory. The dangerous nature of his expeditions to both the arctic and Antarctica, as well as the knowledge gleaned from them, made Byrd's exploits “the wonders of our age,” noted Representative Clarence McLeod of Michigan. Acting on the congressional approval, the Navy Department held a competition to design the medal. Francis H. Packer of New York won the $1,000 prize when the Fine Arts Commission selected his design over 16 other proposals. The medal, measuring 2.5 inches in diameter and cast in three colors, bore the likeness of Admiral Byrd on the face with images of the expedition’s vessels on the back. An inscription, pulled from the legislation, praised the men for their “undaunted service in connection with the scientific investigations and extraordinary aerial explorations of the Antarctic continent.” At a total cost of $6,560, 81 people connected with the expedition were awarded medals: 65 were awarded gold, seven received silver medals, and nine received bronze.